We all need software. Whether it’s an operating system that runs on your computer such as Windows XP, Windows 7, or Mac OSX, or if it’s a productivity suite such as Microsoft Office, or something fun to use like iTunes, software comes from a variety of companies, and can be purchased from a variety of sources. I remember when I purchased my first real computer, that I bought with my own money back in 1996. I bought the machine from Milwaukee PC, a local computer retail store near my home in Wisconsin. It was one of the best experiences of my career, being able to purchase my first machine, the smell of the new computer hardware, and the fancy graphics look of the boxes that the software came in. The whole experience gave me a high of excitement, from that point on I was hooked. Back in that day, most software was sold on the shelves of PC shops, and retail stores like Wal-mart, and OfficeMax. Software distribution since the late 1960’s in the era of the mainframe has been very closely guarded, and ‘licensed’ out to people to use it, rather than ‘sold.’ Since that time, software sales and distribution has gotten more and more specialized, and streamlined with the introduction of app stores, or centralized online locations to download, purchase, and install software for individual platforms such as Synaptec with APT on Linux, the iOS app store for iPhone and iPod touch and the Mac App store for Mac OSX applications.The origin of a centralized source of software was originally developed in 1993 by Matt Welsch, when he first wrote a program for the Debian Linux platform called dpkg, originally written in Perl, then later written in C by Ian Murdock. The concept was taken further by the Advanced Packaging Tool or APT which is a method of installing, and delivering software from a variety of servers. Back then all distribution was done via a command line, which is commonly used on most Linux servers today. In 2003 the concept became more mainstream when Synaptic, a GUI front end for APT was developed by Alfredo K. Kojima. Since that time, many companies have introduced their own niche app stores. The iOS app store for iPod touch and iPhones for example, came online on Thursday July 10, 2008. The CEO of Apple, Steve Jobs recently told The Wall Street Journal that the app store, which hosts dozens of free and for-sale iPhone software, booked $30 million in revenue in its first 30 days. The Android App Store came online in October of 2008 and had a slower start initially, but today both platforms are doing well. On December 6, 2011 Google announced that the Android App store has now hit 10 Billion downloads, and is averaging 1 Billion downloads per month, each month moving forward. Comparing that to Apple’s iOS store, Apple is still the leader with over 20 billion downloads, and over 500,000 applications that are available on the store today. Apple learned from it’s own success on the iOS app store by taking the concept of an app store to it’s Mac OSX platform, releasing the Mac App store with a Snow Leopard software update (version 10.6.6) the mac osx store came online in January of 2011, and has since seen 100 million applications downloaded in it’s first year of operation. I discovered this store when I was researching my next mac, a i7 quad core macbook pro. 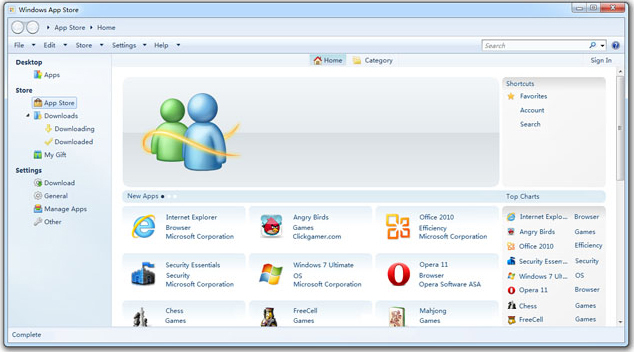 Microsoft has announced plans to launch a similar app store in 2012, citing an initial release in late February 2012. Microsoft also announced a different philosophy of software sales, stating that their initial sofware for sale will be Metro Style apps, or apps that will be used for photo editing, social networks and interactive applications. I’ve personally hesitated to start buying all of my applications through these specialized stores because I still find something valuable with having a cd or DVD for that application in my hand. Either way, it’s always important to backup all of your software, music and in my case avchd video on a reliable external hard drive. If your developing software for your company then the key thing to take away from this article is that retail software sales has a limited shelf life. It will be more important moving forward to shorten the sales process, and use these new distribution channels to get your product out on the iOS store, the Mac App store, or the future Windows App store. This also applies to other specialized markets that are popping up all the time, like the amazon kindle fire store, and stores for specific devices such as the LGPZ750 Internet App TV and it’s app store, and the Roku box store. If your developing a new application then get your app out there and make it compatible with the main 3 platforms in use today at minimum windows, OSX, and Linux, then make sure each version is rock solid stable and then develop mobile versions of the app for the iOS app store and the Android Store, and get it to the market as soon as possible. long) so I guess I'll just sum it up what I wrote and say, I'm thoroughly enjoying your blog. I as well am an aspiring blog writer but I'm still new to everything. Do you have any helpful hints for rookie blog writers? I'd certainly appreciate it. Thanks for the tip! You always have such great deals on this blog, we all really appreciate it! It?s going to be finish of mine day, but before finish I am reading this great post to improve my experience.